Step off the beaten path and head to Schloss Hellbrunn and Salt Mine Hallein. Venture out of the city with trips to Gollinger Wasserfall (in Golling an der Salzach), Liechtensteinklamm (in St Johann im Pongau) and Eisriesenwelt Ice Cave (in Werfen). And it doesn't end there: take in the awesome beauty at Untersberg, make a trip to Altstadt von Salzburg, get engrossed in the history at Mozarts Geburtshaus, and contemplate in the serene atmosphere at St. Peter's Abbey (Stift St. Peter). To find ratings, more things to do, and tourist information, go to the Salzburg road trip planner. Chicago, USA to Salzburg is an approximately 13.5-hour flight. You can also do a combination of flight and train. The time zone difference when traveling from Chicago to Salzburg is 7 hours. Traveling from Chicago in June, expect Salzburg to be a bit cooler, temps between 73°F and 55°F. Finish your sightseeing early on the 2nd (Mon) so you can drive to Hallstatt. On the 3rd (Tue), don't miss a visit to Central Square Marktplatz, then make a trip to Hallstatt Skywalk "Welterbeblick", and then explore and take pictures at Salz Welten. On your second day here, take your sightseeing to a higher altitude at Hallstatt-Dachstein - Salzkammergut Cultural Landscape, choose your vessel at Lake Hallstatt Explorer, and then appreciate the extensive heritage of Old Town. To see where to stay, maps, photos, and other tourist information, you can read our Hallstatt tour planning tool . Drive from Salzburg to Hallstatt in 1.5 hours. Alternatively, you can take a bus; or do a combination of bus and train. Wrap up your sightseeing on the 4th (Wed) early enough to drive to Heiligenblut. Heiligenblut am Großglockner is a municipality in the district of Spittal an der Drau in Carinthia, Austria.GeographyAt the northwestern edge of Carinthia and bordering East Tyrol and the state of Salzburg state, Heiligenblut is located in a high valley of the High Tauern range within the Central Eastern Alps. Start off your visit on the 5th (Thu): take in the architecture and atmosphere at The Church of St Vincent, admire the engineering at Malta High Alpine Road, then take a memorable drive along Grossglockner High Alpine Road, and finally make a trip to Edelweissspitze. To find other places to visit, traveler tips, where to stay, and tourist information, read our Heiligenblut day trip planning site . Traveling by car from Hallstatt to Heiligenblut takes 2.5 hours. Alternatively, you can do a combination of train and car; or do a combination of bus and train. July in Heiligenblut sees daily highs of 73°F and lows of 54°F at night. Finish your sightseeing early on the 5th (Thu) to allow enough time to drive to Krimml. Krimml is a municipality in the federal state of Salzburg, Austria, in the Pinzgau region.GeographyIt is located in the Zell am See District, 54 km from the district's capital. Start off your visit on the 6th (Fri): take your sightseeing to a higher altitude at Kitzsteinhorn and then head outdoors with Sigmund-Thun-Klamm. 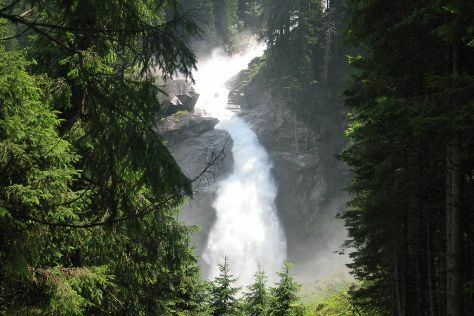 On the next day, admire the sheer force of Krimml Falls (Krimmler Wasserfalle), then take in the architecture and atmosphere at Liebfrauenkirche, and then explore the activities along Lake Zell. 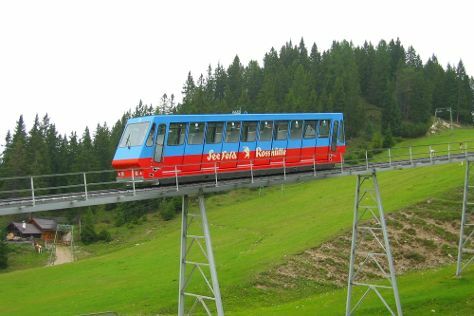 To see photos, other places to visit, maps, and other tourist information, refer to the Krimml trip planner . Traveling by car from Heiligenblut to Krimml takes 2 hours. Alternatively, you can do a combination of taxi and train. In July, plan for daily highs up to 77°F, and evening lows to 57°F. Wrap up your sightseeing on the 7th (Sat) to allow time to drive to Innsbruck. You'll explore the less-touristy side of things at Altstadt von Innsbruck and Stubaier Gletscher. Step out of Innsbruck with an excursion to Achensee in Maurach--about 44 minutes away. There's lots more to do: hit the slopes at Rosshutte, admire the striking features of The Golden Roof (Goldenes Dachl), contemplate in the serene atmosphere at Dom zu St. Jakob, and explore the world behind art at Schloss Ambras Innsbruck (Ambras Castle). For maps, other places to visit, ratings, and other tourist information, read Innsbruck route planner . You can drive from Krimml to Innsbruck in 1.5 hours. Other options are to do a combination of bus and train; or take a train. Expect a daytime high around 78°F in July, and nighttime lows around 57°F. Wrap up your sightseeing on the 10th (Tue) early enough to travel to Vienna. You'll discover tucked-away gems like Ringstrasse and Das Goldene Wiener Herz. And it doesn't end there: take in nature's colorful creations at Schonbrunn Palace, meet the residents at Schönbrunn Zoo, examine the collection at Imperial Palace (Hofburg), and admire the landmark architecture of St. Stephen's Cathedral. To see ratings, where to stay, more things to do, and other tourist information, read Vienna day trip planning app . You can fly from Innsbruck to Vienna in 2.5 hours. Other options are to take a train; or drive. In July, daily temperatures in Vienna can reach 82°F, while at night they dip to 61°F. Wrap up your sightseeing on the 13th (Fri) early enough to travel back home.